Microsoft decided to ship Windows 8 without a start menu and the main reason for that was probably to get users to use the start screen of the operating system even though Microsoft claimed it was based on telemetry data it collected. While it is certainly possible to use Windows 8 that way after some getting used to time, it is a huge change for veteran users who worked with the start menu their entire computing life. 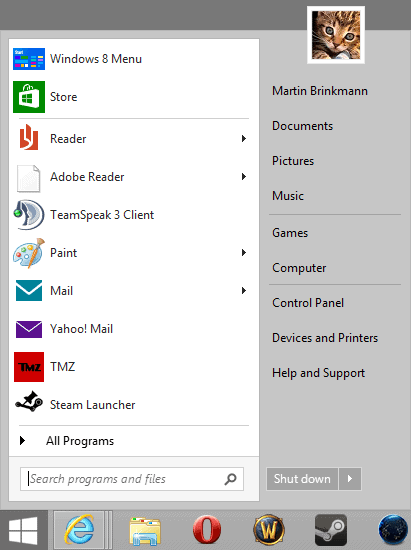 Companies like Stardock and Sweetlabs and open source projects like Classic Shell jumped in and made their own start menu programs available for Windows 8. All have in common that they add the start button back to the desktop interface of Windows 8 and Windows 8 Pro. A click on the button displays a menu that looks almost identical to the start menu of the Windows 7 operating system. Stardock recently announced that downloads of Start8, the company's start menu replacement for Microsoft's newest operating system crossed the 3 million mark and while that does not equal installations, it is likely that the majority of users who downloaded the program have also installed it on their system. If we take Microsoft's 60 million licenses sold up to date announcement it could very well mean that about 5% of all Windows 8 users are using Stardock's start menu replacement. Note that 60 million licenses does not necessarily mean that 60 million users are using Windows 8 as it includes licenses sold to OEMs as well. Start8 is on the other hand just one of the start menu replacements. Sweetlab's Pokki adds another 1.5 million start menu downloads to the equation. Then there is Classic Shell which has seen a big jump in downloads at the same time the first preview releases of Windows 8 were released to the public. The program has been downloaded more than 700,000 times in December 2012 alone and more than 1.8 million times since the release of Windows 8 in October 2012. It highlights that a sizable part of Windows 8's user base misses the start menu that much that it purchased (in the case of Start8), download and installed start menu programs on Windows 8. Will it be enough to convince Microsoft to add a start menu back to Windows 8 or the successor of the operating system? It is highly doubtful that this is going to happen unless Windows 8 will flop big time in the coming year. “If we take Microsoft’s 60 million licenses sold up to date announcement it could very well mean that about 5% of all Windows 8 users are using Stardock’s start menu replacement.”..
Wrong. Licenses sold are NOT Windows 8 installed/Used. There are about 20 Million Windows 8 users, which makes the various Start Menu applications installed on about 30%+ of Windows 8 PCs. I did note that below about the 60 million. There is no official user count for Windows 8 nor count of installations of the start menus. Sorry, it should have been “correction” instead of “wrong”. “…unless Windows 8 will flop big time in the coming year.” It already has: it’s been reported that Windows 8 is being used even less than Windows Vista, at the same point in its lifespan. Even if Win-8 is a huge worse than Vista flop, can Microsoft afford to reverse course and bring back the start button? I suspect not. The apps store is its future river of gold which will in the long term be much more profitable than selling OSs. It is cheap money too, developers do all the work and Microsoft just creams off a substantial fee on every app sold. However, to make it work they need to get everyone using apps and this is less likely to happen if we’re all using the desktop. So I can’t see the company changing course. It may be financial suicide to do so. There may be some rocky times ahead, but it will probably decide to wear us all down until we’re all using the new interface. I was wondering why Microsoft refers to the number of sold licenses. They should now exactly how many W8-systems are actually running. They have the activations and they have LiveComm.exe which does a pretty good job connecting to Microsoft every time, Windows is up. I use Classic Shell and it is pretty good. It is customazible (Screenshot: http://prntscr.com/phq9i, background color cannot be changed yet), so I do not see what further advantages Start8 could bring. PS: Am I the only user experiencing that W8 is much slower than W7? I don’t mean booting, I have severy delays when starting a programm or opening a file. My hardware very fast, it might have to do with calling the hard-drives. Daniel I’m not experiencing slow downs on Windows 8 compared to Windows 7. There must be another reason for that. What I suspect will happen is someone at microsoft with some reasonable logic will realize what the desktop market needs… *gasp* is a desktop and not a touch interface. And with businesses not selling their office spaces or cubicles anytime soon the desktop will remain. Windows 9 or 10 should return and fix these woes (hopefully with a real server OS again too). While 8 will be either dropped liked ME or Bob but more than likely just phased into RT and used for their tablet/phone markets. There may be any driver problems/conflicts. @Xi, As far as that goes, they’ve had that issue on every OS update… heck even some service packs screwed up the drivers. The first thing I will do with my first Windows 8 machine is installing a start menu ! Win8 is little more then a VERY poorly disguised retail kiosk. for the home and office. It’s not made such a big splash as the Start alternatives mentioned in the article, but I’ve settled on StartIsBack (www.startisback.com) – for me it just works. hate the flat 2d look cause it’s hard to sport outline of tabs and scrollbar especially when it white color background. love the old translucent windows edge (my cpu can afford a little cycles). cant change colors of syntax highlighting, title bar color (always black), etc. nothing customizable at all. the whole department involve in win8 design should be given pink slips.